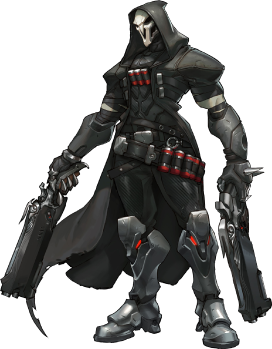 Reaper is one of the strongest close ranges Offensive heroes in Overwatch. There is also no heroes who can handle a reaper close range 1v1. The general strategy for Reaper is getting up close and dealing huge amounts of damage, he can accomplish this with his Shadow Step Ability. This ability allows reaper to flank the enemy and kill low hp targets, before going invulnerable with Wraith Form. He does have weaknesses and certain heroes are effective reaper counters. McCree is among those Reaper Counters, mainly due to his Flash-Bang Stun. This ability allows McCree to do the damage needed to kill Reaper before he can use his wraith form. When playing reaper, Players should focus their gameplay around Wraith Form’s cooldown. When Wraith Form is off cooldown, you can play more aggressively and even suicidal, since you have it available to escape almost any bad sustain if needed. When Preparing an ambush with Reaper Ultimate (Death Blossom), look for ledges or other high areas that you can jump off of to get right into the middle of the enemy team before activating your Ultimate. McCree: Flash-Bang stun gives reaper almost no counterplay. Since McCree has better long range damage as well he can win this match-up head on. Pharah: Can avoid Reaper short range damage rather easily, while being able to return fire of her own. this alone makes her among the best reaper counters in Overwatch.